Our business is all about giving you the professional support you need to help you succeed. You will find us friendly, approachable and very knowledgeable. Clients love the fact that ‘routine’ accountancy and audit work is turned around promptly, but also that Integra provides effective answers to more complex tax and business matters. Our approach is simple, with services built around your needs. So we have dedicated teams delivering practical support with payroll management and reporting, HR issues, Sage accounting packages and more – giving you extra time to add value to your business. An ACCA Quality Checked firm, we train our own accountants and tax specialists. We are proud of their exam successes and we are especially delighted that many choose to stay with us for ongoing professional development. Find out more about what the team at Integra can do for you. Phone 01455 238551 to set up an initial meeting – free of charge and without obligation. Or email us, and we will be happy to contact you. A friendly, approachable and very knowledgeable team. 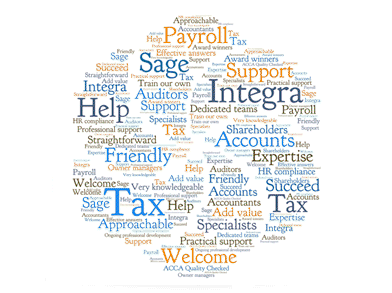 As well as general accountancy, audit and tax skills, the Integra team also has individual specialist skills which enables us to tailor our service to your needs.